Columbus Day is a national holiday in many countries of the Americas and elsewhere which officially celebrates the anniversary of Christopher Columbus's arrival in the Americas on October 12, 1492 (Julian Calendar; it would have been October 21, 1492 on the Gregorian Proleptic Calendar, which extends the Gregorian Calendar to dates prior to its adoption in 1582). Christopher Columbus was an Italian explorer who set sail across the Atlantic Ocean in search of a faster route to the New World. His first voyage to the New World on the Spanish ships the Santa María, Niña, and La Pinta took approximately three months. Columbus and his crew's arrival to the New World initiated the Columbian Exchange which introduced the transfer of plants, animals, culture, human populations, and technology between the new world and the old. 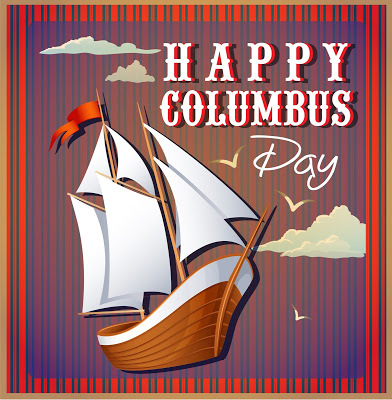 The landing is celebrated as "Columbus Day" in the United States but the name varies on the international spectrum. In Latin America, October 12th is known as "Día de la Raza" or (Day of the Race). Some countries such as Spain refer the holiday as "Día de la Hispanidad" and "Fiesta Nacional" where it is also the religious festivity of la Virgen del Pilar. Belize and Uruguay celebrate it as Día de las Américas (Day of the Americas). Argentina's former president Cristina Fernández de Kirchner officially adopted "Día del Respeto a la Diversidad Cultural" (Day of Respect for Cultural Diversity) November 3, 2010. Wikipedia Editors. Columbus Day 2019.